← I Know Who Killed Me – the ultimate love-it-or-hate-it movie? One of the tasks involved in doing reviews on equipment is identifying faults with that equipment. That may seem easy, but it isn’t always. If you have a lousy picture while watching HDTV, is it the HDTV receiver that’s the problem? Or the display system? Or something else? 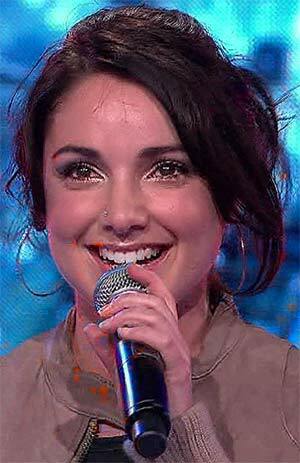 For example, I watched most of this year’s edition of ‘Australian Idol’ which was presented in high definition. Although shot with HD Video cameras (ie. 1080i models) and therefore interlaced, the picture quality was still such to be very impressive. But a few weeks ago I pulled down a projector I had been using and plugged in a different, more expensive (ie. $15,000) one. That night I sat down and watched an episode of Australian Idol and, by golly, there were these nasty colour flashes across the screen, particularly obvious on the contestants’ faces (see picture at right). I was tempted to jump to the conclusion that there was something wrong with the projector. After all, that was the only thing in the signal feed that had changed since the previous week, when no such problems were evident. But I like to double check these things. First, before I finished off my review I pulled down that projector and installed a different one. Ah hah! Same problem. I could finish my projector review and confidently report that its picture quality was superb. But if it wasn’t the projector, where else could the problem be? I downloaded a bit of the video from the HDTV PVR onto my computer and examined it there. Ah hah! The colour splotches were in the digital video itself. That ruled out a decoding error by the HDTV PVR. It began to seem likely that it was a problem with the TV station’s encoding of the video. The next week the picture was just as bad, but the week after that it was back to high quality. The pretty much affirmed my final theory. The only effective way of double checking, though, is to adopt a different technique for the check. If you are adding up a column of numbers, you should start from the top the first time, and then from the bottom the second time. That way markedly reduces the chances of repeating the same error. Recently I did a double check without keeping the principle of different techniques sufficiently in mind. In my item Toshiba HD DVD goes 24 frames per second, oddly I noted that with the new v.2.5 firmware, the Toshiba HD-XE1 HD DVD player could deliver 1080p24 video. But I also reported that it seemed to be delivering an incorrect resolution of 1,921 by 1,080 pixels, rather than the proper 1,920 by 1,080 pixels. This was the information provided by an InFocus IN82 HD DLP projector. Of course, I decided to double check. And to triple check. First, I played the HD DVD version of Digital Video Essentials with the output of the Toshiba set to 1080p60, and then to 1080p24. Using the high resolution test section of this disc, I was able to determine that the resolution was indeed slightly incorrect. To triple check I output the Toshiba’s video at 1080p60 and then converted it to 1080p24 using the DVDO iScan VP50PRO video processor. The video output was at the correct resolution, as revealed by the InFocus projector’s information display, and by the test pattern performance. Well, that was it then. For some reason the Toshiba HD-XE1 was outputting 1080p24 at 1,921 rather than 1,920 pixels. But I’d overlooked something. If the InFocus projector thought that it was receiving 1,921 pixels, it would rescale the image horizontally even it it wasn’t. The second step of my process was invalid as check because it was effectively a repeat of the first step. As I discovered yesterday afternoon. For some reason my emails aren’t making their way through to Toshiba Australia, so my alert to it regarding that earlier blog item was never received. Since I received no reply, I did a follow up email a couple of weeks later — also never received I have since found out. So a couple of days ago I contacted its local PR agency. Yesterday Toshiba rang me up to discuss the matter. While I was on the phone with them I played the Digital Video Essentials disc again from the Toshiba at 1080p24, but this time it was feeding into the wonderful Marantz VP-15S1 projector. Oh oh, a perfect rendition of the high resolution image. Each dot from the disc was shown in its appropriate place on the display. Clearly the Toshiba was, in fact, outputting the correct resolution. So now I’ve added a bright red correction to the original blog item. It seems that there is something that the Toshiba doesn’t like about the InFocus, or the InFocus doesn’t like about the Toshiba. There is still the puzzle of where, precisely, the problem lays. But it isn’t all Toshiba’s fault by any means. Incidentally, a new version of the Toshiba HD DVD firmware has just become available. Version 2.7 now adds the ability for the HD-XE1 (but not the lesser models, because they don’t share the XE1’s HDMI 1.3 specification) to deliver Dolby Digital Plus, Dolby TrueHD, DTS-HD Master Audio and DTS-HD High Resolution to a suitable home theatre receiver for decoding by that receiver. But more on that another time. This entry was posted in DTV, Firmware, HD DVD, HDTV, Testing. Bookmark the permalink.